Anna Maria is known for its white sandy beaches, turquoise water, and charming array of local restaurants and shops. It also happens to be home to my favorite sunset spot. The laid back atmosphere of this island is unlike any other. There are no chain restaurants or highrise buildings, which makes this the most charming island you’ll ever see. It’s a popular destination for tourists and locals alike, because one day spent exploring this small paradise, and you’re hooked. But have you ever taken the time to think about how you’re favorite beach town came to be? The island was first discovered by Timucan and Caloosan Native American tribes. At that time, the island was only accessible by boat, and the tribes traveled to it to hunt and fish. It was then ‘discovered’ by Spanish explorers in the name of the Spanish Crown. There was no permanent settler on the island until 1892 when George Emerson Bean became the first resident. He settled on the northern tip of the island, which is now fondly known as Bean Point. It was Bean, his son Will, and Charles Roser, who developed the area by adding streets, a water system, and homes. Charles Roser built the first church in honor of his mother, and it still stands to this day. Complete with a church and a school, the island truly became a community. In 1921, the first bridge was built. The wooden bridge connected Anna Maria to the mainland, linking it with the small fishing town of Cortez. This helped the island blossom. Auto traffic increased and new businesses began to sprout. In the 1950’s the Manatee bridge was built to help with traffic and increased tourism. Today the island is a thriving community full of old world charm. It’s a popular destination for tourists and home to many. With no shortage of rentals and charming island homes, everyone can find a slice of paradise. The colorful downtown is full of delicious local restaurants and some of the best ice cream you’ll ever have. Take a walk down the beach, get some sand in between your toes, and find the best place to watch the sunset. You can even take a walk through history at the Anna Maria Island Historical Society Museum. The building, constructed as an icehouse, then used as an auto garage, then repurposed as a sea turtle hatchery, has finally found its identity as a museum. There, you can see the old roofless jail, learn all about the settlers, and see the old world charm up close and personal. 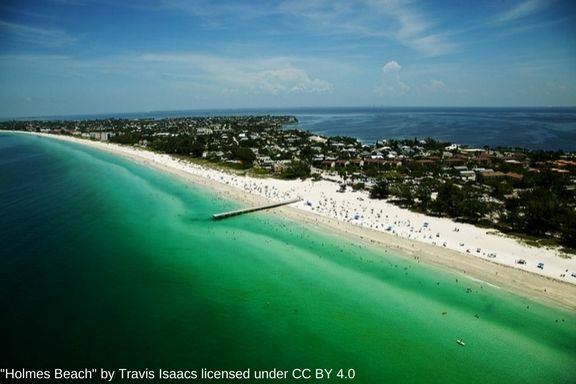 To learn more about Anna Maria Island, take a look at sites the above information came from.